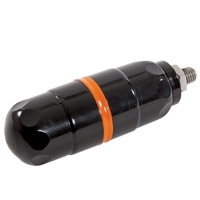 This is a self-contained, battery-operated sonde, measuring 1.53” x 4.13” (39mm x 105mm). It can be connected to a Flexrod for locating pipes and ducting etc. It transmits on 33kHz and can be normally located to a maximum depth of 16’ (5m).